2149. The Polmaise system of heating. According to this system, neither hot-water pipes nor flues are required, but the house is heated by the circulation of hot air, warmed by a stove erected behind the wall of the hothouse. In the original house erected at Polmaise, in Stirlingshire (of which fig. 642. is a ground-plan, and fig. 643. a cross-section), there was a hot-air chamber 18 in. in height (f in fig. 643. ), placed over the stove (d), a space 6 in. wide being left all round it. The air from the hot-air chamber was admitted by the outlet (e) into the house through the woollen cloth (h). This cloth was nailed underneath a stage for plants extending to within 2 ft. from each end of the house; and it was intended to disperse the warm air equally through every part, and to produce steam occasionally by applying water through the rose of a watering-pot upon the cloth. An arrangement was made for supplying cold air from the exterior to the stove through valves placed at the ends of the drain (b), which were 1 ft. square; the air which had been chilled in the house entering the drain through gratings at a a in fig. 642. The cold-air drain extended along the footpath of the house, the flags of which formed its covering; the external air being admitted to it by valves placed at each end; while the air chilled in the house entered by the iron gratings in the flags. According to this first plan the woollen cloth was only moistened when it was wished to steam the house; but after a short time a plan was contrived for keeping the air constantly moist by having a gutter, for conducting water, fixed along the upper board of the stage for plants, in which were inserted woollen threads, which were so placed as to hang down for a few inches on the woollen cloth, and thus to act as a siphon in keeping the woollen cloth constantly moist. At each end of the house was a valve to admit fresh air, which was conducted to the stove and heated before it was suffered to enter the house. This continual supply of cold air from openings close to the ground was one of the features in which the Polmaise heating differed from Penn's system; and another very important difference is, that the heated air is admitted by an aperture near the ground, instead of entering by an aperture near the top, and thus being suffered to lose a great portion of its heat. 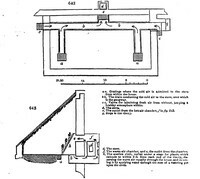 In 1846, the late Mr. Meck promulgated an improvement on the Polmaise system; and according to his plan the cold air passed below the level of the floor into the stove chamber, became heated by passing over an extended hot iron plate, and then over a cistern of water, entering the house beneath a tan bed, and escaping through ventilators. The woollen cloth was omitted, as it was found difficult to keep it in a proper state of moisture, and as the water, over which the hot air passed, supplied its place. The hot plate having been found in practice frequently to crack, a large flag-stone was substituted. Fig. 644. shows the ground plan, and fig. 645. the section, of a house erected at West Plean in Stirlingshire, in which a is the stove; b, the hot-air chamber; c c, mouths of the cold-air drain; d, cold-air drain; e, the point at which the hot air enters the house; f, a pit heated by hot air. The admission of hot air into the house and pit is regulated by means of valves, so that the one may be heated independently of the other, or both may be heated at once if required, g is a vertical valve for the admission of the external air, the cold-air drain (d) only returning the cold air from the house to be reheated by the stove; whereas in the original house at Polmaise there was only one drain for both the external and internal cold air, and the cold air occasionally was supposed to rise through the gratings at c c, and to chill the house; h is the ash-pit.